"This disc is evidence of a true original in sound and the originality is unclouded and yet more enthralling in these smaller formats. The disc also breaks with the series tradition by printing all the sung and referenced words. This is to me a surprise winner and one in which Ives emerges as a master of dissonance and a magician of mood, evocation and suggestion." Before the 20th century, there was very little in the way of American concert music. There was a handful of composers who were notable exceptions but these almost always followed the European compositional traditions. 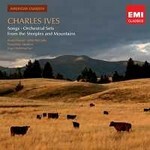 Not until the arrival of Charles Ives (1874-1954) could America boast an original, native-born, composer of it's own.